In the immortal words of the great Douglas Adams, “Space is big. You just won’t believe how vastly, hugely, mind- bogglingly big it is.” And because it is so enormous, it has thus far been impossible for humans to travel very far from home. Using the example of the Voyager 1 – the probe launched in 1977 which is still traveling on its merry way at 36,000 MPH – our current technology would allow us to reach the nearest star to Earth in about 70,000 years. If we are ever going to send a human team beyond the solar system, we will have to come up with a revolutionary propulsion system. That system may very well be VARIES, or Vacuum to Antimatter-Rocket Interstellar Explorer System. 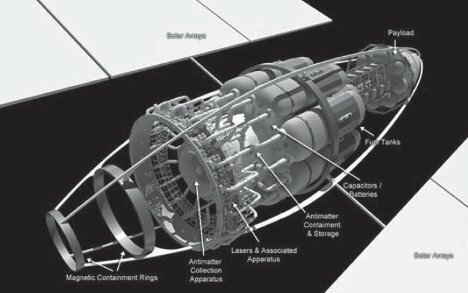 The spacecraft would work by basically turning nothing into something. You see, the “vacuum of space” is not quite as empty as classical physics would suggest. On the quantum level, space is actually chock full of virtual particles which are constantly vacillating between existing and not existing. 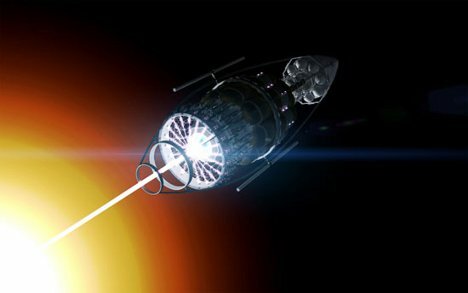 If we as a species are able to create a laser powerful enough, we might be able to force those particles into permanent existence and use them to do stuff – stuff like propelling spacecraft. This massive laser will be powered by gigantic solar panels – each being hundreds of miles in area – which can receive their power from any star they happen to be near. The incredible concept is apparently based on real science, but as of right now we just can’t make a laser strong enough.